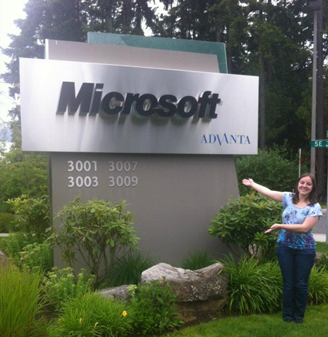 For three months this summer, Colleen Forbes, ’14, gained work experience as an intern for Microsoft in Redmond, Wash. This internship allowed Forbes, a computer science major, to experience three technical roles in Microsoft. Alongside two fellow interns, she learned the tasks of a program manager, a developer and a tester of an embedded Windows 8 demo application. Forbes interned through Explore Microsoft, a 12-week summer internship program. The internship gives students a taste of what it’s like to work at Microsoft and exposes interns to the field of software development. The program emphasizes working as a team and exploring different avenues of programming and design. “It taught me a lot about all of the different ins and outs of a big company like Microsoft, and the different aspects of working on a team made up of people from a lot of different backgrounds,” says Forbes, who encourages other students to experience this kind of internship. In addition to learning the in-depth art of programming, Forbes discovered how Microsoft functions and interacts worldwide. At Whitworth, Forbes is a member of the on-campus club Global Servants for Christ. She also is involved on campus as a small-group leader, a supplemental instruction facilitator for Computer Science I and Computer Science II, and a student worker in the library. After college, Forbes would like to live and work in the Seattle area. She plans to work for Microsoft or another technical company that supports education. Microsoft was founded in 1975 by Bill Gates and Paul Allen when they sold their first program, called BASIC, to a company in Albuquerque, N.M. Microsoft Research was established in 1991 and has become one of the largest computer science research organizations in the world. More than 850 computer scientists are pursuing research in 55-plus areas of study in 13 locations around the world. Whitworth strongly encourages students to complete internships. Several majors and minors require students to finish an internship in order to graduate. Whitworth’s 2011-12 Courage at the Crossroads strategic plan and vision statement includes Key Point Indicator 5.2.1, which documents the university’s resolve to “increase to 75 percent the number of traditional undergraduates who complete an internship, a practicum experience or a research project before graduating.” Currently, 64 percent of undergraduates have completed an internship. To learn more about internship opportunities at Whitworth, visit: www.whitworth.edu/Administration/StudentLife/CareerServices/Students/Internships.